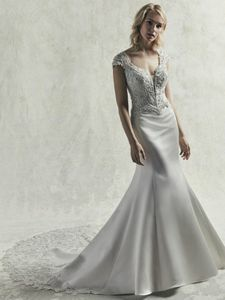 Description: Beaded lace motifs and Swarovski crystals evoke vintage glamour in this Carlo satin fit-and-flare wedding dress, accenting the bodice, illusion scoop back, and illusion train. Featuring sheer cap-sleeves and illusion plunging sweetheart neckline, also accented in beaded lace motifs. Finished with covered buttons over zipper closure, trailing from back to train.